The Michael G. DeGroote Centre for Medicinal Cannabis Research aims to establish and build the evidence for medicinal cannabis through curation of evidence-based content, conducting cutting-edge research and developing a network of medicinal cannabis professionals. In photo (L-R): James MacKillop, centre director; Dr. Jason Busse, associate director; and Dr. Ramesh Zacharias, co-chair medical advisory board. Dr. Ramesh Zacharias has been prescribing medical cannabis for more than a decade. As the medical director of the Michael G. DeGroote Pain Clinic and co-chair of the Physician Advisory Group at the Michael G. DeGroote Centre for Medicinal Cannabis Research (CMCR) at McMaster University in Hamilton, Ont., Zacharias works with a motivated team that wants to bring more cannabis knowledge to the forefront. A growing number of licensed producers (LPs) are recognizing the importance of working with the research community to produce more peer-reviewed results. The more science-backed information becomes available, the more physicians might begin prescribing cannabis-based products. And isn’t that the goal for producers in this competitive and rapidly changing industry? The medical benefits of cannabis have been shown in some studies to date, but as both researchers and LPs tell Grow Opportunity, those studies are few and far between. Studies can be expensive and Zacharias says LPs should know they need not contribute monetarily in order to make a difference. At McMaster’s pain clinic, trial costs are covered by the clinic and products are the most valuable contribution LPs can provide. The pain clinic has partnered with Vaughan, Ont.-based medical cannabis producer CannTrust to conduct a randomized, double-blind, placebo controlled clinical trial on the efficacy of its proprietary cannabis oil capsules for managing chronic, non-cancer pain. “We are hoping that our proprietary cannabis oil capsules will reduce dependence on much stronger and dangerous medications, such as opioids,” says Ilana Platt, vice-president of innovation and global regulatory affairs at CannTrust. CannTrust is providing two products for the clinical trial – a CBD oil capsule and a combination CBD/THC oil capsule – that will be randomized to participants. A third group of patients will receive placebo capsules that do not contain CBD or THC. The trial will be comprised of 309 participants split randomly between two phases. In phase one, both the patient and the prescriber will know what treatment is being prescribed. And in phase two, neither party will know what has been prescribed until the end. The patients will be monitored over 12 weeks to see whether either product has reduced their pain or improved their overall quality of life. Zacharias says the end goal is to get clarity on both the benefits and potential harms of cannabis, including whether there is a difference between those two products as it affects pain, sleep, mood and anxiety. He says there are about half a dozen research projects that LPs have been involved with at the clinic, each with a different set of researchers depending on the topic and the interest of the LP for their product. McMaster’s main criteria for engaging with an LP to do research involves reserving the right to publish the study findings regardless of the results. “We are an academic institution at McMaster. We are neither pro-cannabis nor anti-cannabis; we’re simply pro-evidence,” says Dr. Jason Busse, associate director at the CMCR. CannTrust is also partnered on another university trial with Australia’s Gold Coast University Hospital. It’s a clinical trial to determine the effectiveness of CannTrust’s CBD oil in delaying the progression of ALS or motor neuron disease. Health Canada currently has more than 350,000 patients registered to use medicinal cannabis, including 10,000 veterans. And the numbers rise every year. “We have a standing meeting once a week and I can’t remember the last one where we did not have a licensed producer come to be part of that meeting,” Busse notes. He says more LPs are becoming interested in working with researchers because they recognize that there’s an information gap. “There’s a lot of clinicians that are simply hesitant to authorize medicinal cannabis at all because of their limited experience and limited knowledge about the evidence out there,” he explains. As a physician who later entered the medical cannabis space, Dr. Peter Blecher, understands the issue. Starseed has dedicated resources and funds to do its own studies that investigate both condition outcomes and displacement of opioids and other medications using cannabinoids. The LP works with the Laborers’ International Union of North America (LiUNA), Canada’s largest construction labour union, where overuse of opioids for pain is prevalent among workers. Construction workers over index for chronic pain, and possibly medication use, as a result of their work, Blecher explains. A recent study in Massachusetts found that one in four opioid deaths involved construction workers, an industry in which some 15 per cent have a substance abuse disorder – twice the national average. “If cannabinoids can help displace that, I believe that we can actually create a safer workplace with less absenteeism, less presenteeism and hopefully show improved safety records and reduced accidents,” Blecher says. Through LiUNA, Starseed also works with Seasons Retirement Homes owned by the union. The producer is partnering with the organization to study the benefits of cannabis in managing delirium, and potentially dementia, in the elderly population. Blecher explains that the average retirement home resident is on a dozen or more medications, many of which are sedatives for mood disorders, anxiety or pain. The cumulative effect of this medication burden can lead to delirium, and in turn to increased falls and fractures – and that, he explains, could result in extended bedrest that leads to strokes and heart attacks. 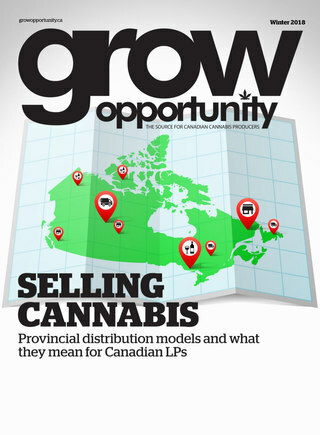 Canadian producers aren’t the only ones focused on improving quality of life. Although the U.S. hasn’t federally legalized marijuana yet, the states that have are busy making their own advancements. Take Jason Cranford, founder of the Flowering HOPE Foundation (FHF) in Colorado. He is funding the first U.S. clinical study on the benefits of medical cannabis in partnership with Clover Leaf University in Denver. FHF is a non-profit organization that supports the medicinal use of plant-derived cannabinoids, called phytocannabinoids. The organization was one of the first licences issued for hemp cultivation and partnered with Clover Leaf to comply with federal law that requires all hemp cultivators in the U.S. to be involved in research studies with an institution of higher learning. FHF is paying for the research with the $40,000 it raised at a golf tournament. “The three things we wanted to study were autism and cannabinoids, epilepsy and traumatic brain injuries [TBI],” Cranford explains, adding that NFL players suffer from the latter and take pharmaceuticals that make it worse. His team applied for all three studies through the Institutional Review Board (IRB) and were approved for all three, but the TBI study is being rolled out first. FHF wants to pave a new path for TBI treatment. “We want to educate the neurologists through this research so that they know there’s another option,” Cranford says. He understands there’s much more give than take in the work he is doing, but he believes in the wider benefits that could result from his investments in research. Those benefits are not limited to North America. European patient numbers are predicted to surge from 130,000 to 225,000 in 2019 in the region’s three largest markets (Italy, Germany and The Netherlands), according to a recent report by legal cannabis expert Prohibition Partners. The forecasted increase is due to both legislative change and increased awareness of the potential health benefits of cannabis products. It may be too soon to tell what the future of the medical cannabis sphere will look like, but Busse says the research needs to be strong enough to stand up to scrutiny from the most intense critics. For certain medical conditions, the evidence is strong, notes CMCR’s Zacharias. “The bottom line is we have some research and some evidence that is relatively strong for certain conditions: seizures in pediatric patients, patients who have spasticity disorders like MS and moderate evidence for patients with chronic pain.